A meaningful gift for all occasions! UE Loyalists Bridge Annex believes “meaningful membership” can take many forms. 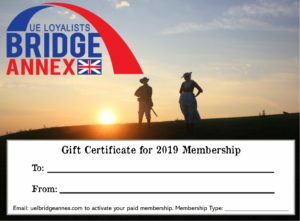 Joining yourself and gifting memberships to your friends and family is a wonderful way to share in this innovative approach to connecting with a dynamic community of history enthusiasts while preserving the legacy of the United Empire Loyalists. When you purchase a pre-paid membership as a gift, you will be able to download and print a gift certificate, once payment is confirmed. 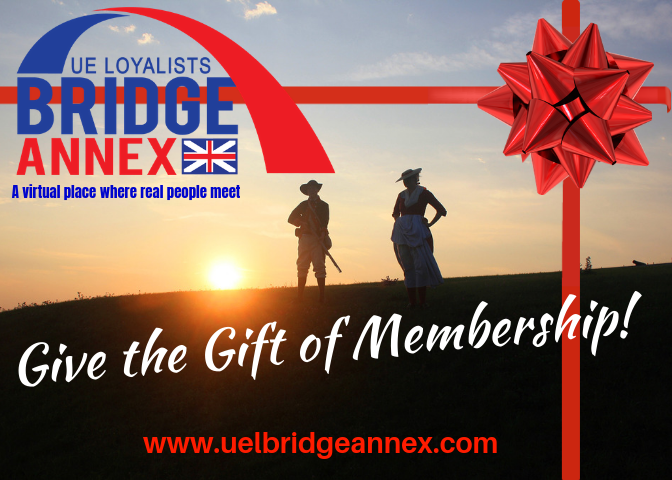 The recipient of your thoughtful gift will then be able to make contact with us once they receive their gift certificate to activate their membership and start reaping the many benefits of being a member of UE Loyalists Bridge Annex. 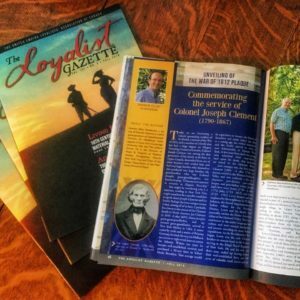 2 issues of The Loyalist Gazette (Magazine or Digital available) produced by UELAC. Now in full colour! 4 issues of Bridge Annex Times: A digital magazine-style newsletter with a mix of branch news, historical and genealogical articles, and more! 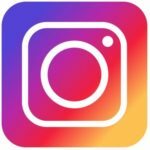 Our website is full of information and links for informational and research purposes – and is constantly being updated! Upon completion of your purchase, you will be able to download a printable Gift Certificate (colour or black and white). For more information see: Commonly Asked Questions below. Which Membership Should I Gift? 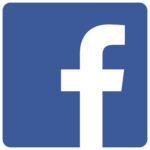 *Primary and Secondary Members have equal access to content. When does the membership begin? What if the recipient is already a primary member of another branch, but I didn’t know? We will take into account when the primary registration was processed. If we process first, then the individual will be a primary member of our branch (if that is the gift you gave). The individual will not miss out on any of the usual benefits of any branch regardless. While we do not offer refunds, we will work with you to adjust the membership level and fees if duplication happens. Please note: For Secondary Membership gift certificate purchases, the individual must be a member of another UELAC branch to qualify for Secondary Membership. They will be asked to confirm their primary branch upon activation of their membership.